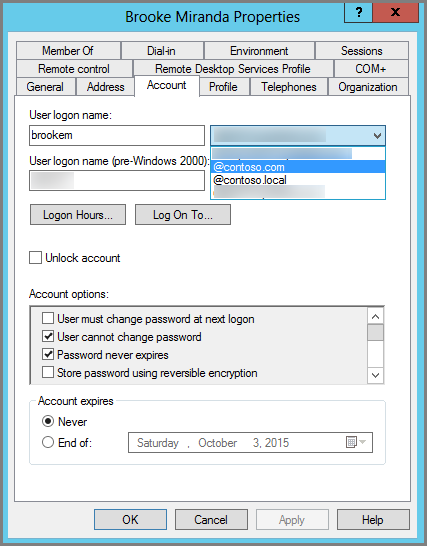 Active Directory: .local domain design and Office 365. Microsoft since the release of Windows 2000 Server have recommended that any Windows Server environment promoted to host an Active Directory forest/domain should be configured with a registered Top Level Domain (TLD), such as .com, .net, .org etc. Many companies have ignored this advice and taken the approach of, my internet presence is for example markparris.net so I will therefore call my Active Directory forest markparris.local. This approach to the .local namespace in Active Directory has caused no real issue, with exception of Apple Mac Integration into the environment (see below). With the onset of the cloud, premises and off premises computing the .localnamespace now causes a potential issue. The .local namespace issue may be resolved with a simple fix or it could involve a fair amount of remediation work. In order to use Microsoft Office 365 Cloud Services with an on premise Active Directory synchronised via DirSync to the “Microsoft Cloud” the forests namespace or to be more precise the users UPN (User Principal Name) must be an internet registered TLD. In most companies this can be easily achieved by setting all cloud users UPN’s to their email address (or another registered namespace) and then this is what the user presents to Microsoft, to be authenticated/validated. In some companies, the .local UPN namespace may already be in use for something else and a UPN remediation project may need to be completed prior to any Microsoft cloud integration. This could again be a simple resolution or a huge global project. So to summarise, the recommendation is still not to use the .local namespace in any new Active Directory implementation, if you have utilised the .localnamespace and you have a requirement to implement Office 365, then identify and configure a registered UPN for the affected accounts. To be fair to Microsoft, they did tell you. As I put my thoughts down, it has also become apparent to me that anyone with an Active Directory namespace that uses a TLD namespace that is not registered to them will also have this same issue and will also need to configure new UPN’s. Today I did this live in a production environment for only the second time in my career. When you synchronize your on-premises directory with Office 365 you have to have a verified domain in Azure Active Directory. Only the User Principal Names (UPN) that are associated with the on-premises domain are synchronized. However, any UPN that contains an non-routable domain, for example .local (like billa@contoso.local), will be synchronized to an .onmicrosoft.com domain (like billa@contoso.onmicrosoft.com). If you currently use a .local domain for your user accounts in Active Directory it’s recommended that you change them to use a verified domain (like billa@contoso.com) in order to properly sync with your Office 365 domain. What if I only have a .local on-premises domain? The most recent tool you can use for synchronizing your Active Directory to Azure Active Directory is named Azure AD Connect. For more information, see Integrating your on-premises identities with Azure Active Directory. Azure AD Connect synchronizes your users’ UPN and password so that users can sign in with the same credentials they use on-premises. However, Azure AD Connect only synchronizes users to domains that are verified by Office 365. This means that the domain also is verified by Azure Active Directory because Office 365 identities are managed by Azure Active Directory. In other words, the domain has to be a valid Internet domain (for example, .com, .org, .net, .us, etc.). If your internal Active Directory only uses a non-routable domain (for example, .local), this can’t possibly match the verified domain you have on Office 365. You can fix this issue by either changing your primary domain in your on premises Active Directory, or by adding one or more UPN suffixes. Change your primary domain to a domain you have verified in Office 365, for example, contoso.com. Every user that has the domain contoso.local is then updated to contoso.com. For instructions, see How Domain Rename Works. This is a very involved process, however, and an easier solution is to add UPN suffixes, as shown in the following section. 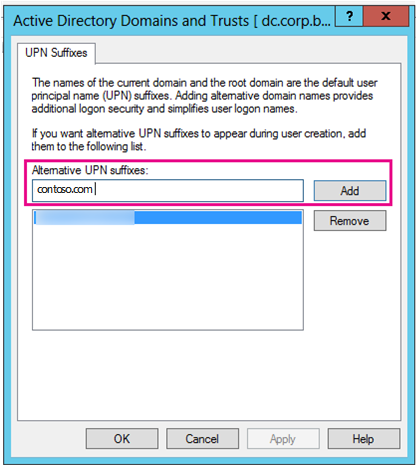 You can solve the .local problem by registering new UPN suffix or suffixes in Active Directory to match the domain (or domains) you verified in Office 365. After you register the new suffix, you update the user UPNs to replace the .local with the new domain name for example so that a user account looks like billa@contoso.com. After you have updated the UPNs to use the verified domain, you are ready to synchronize your on-premises Active Directory with Office 365. On the server that Active Directory Domain Services (AD DS) runs on, in the Server Manager choose Tools >Active Directory Domains and Trusts. 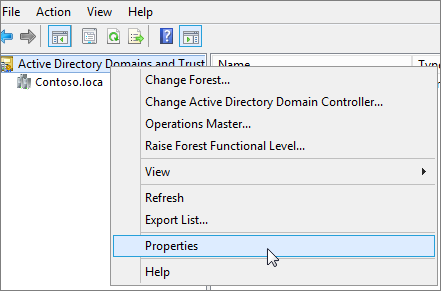 Press Windows key + R to open the Run dialog, and then type in Domain.msc, and then choose OK.
On the Active Directory Domains and Trusts window, right-click Active Directory Domains and Trusts, and then choose Properties. On the UPN Suffixes tab, in the Alternative UPN Suffixes box, type your new UPN suffix or suffixes, and then choose Add > Apply. Choose OK when you’re done adding suffixes. On the server that Active Directory Domain Services (AD DS) runs on, in the Server Manager choose Tools >Active Directory Active Directory Users and Computers. Select a user, right-click, and then choose Properties. On the Account tab, in the UPN suffix drop-down list, choose the new UPN suffix, and then choose OK. Complete these steps for every user. Alternately you can bulk update the UPN suffixes by using PowerShell. If you have a lot of users to update, it is easier to use Windows PowerShell. The following example uses the cmdlets Get-ADUser and Set-ADUser to change all contoso.local suffixes to contoso.com. See Active Directory Windows PowerShell module to learn more about using Windows PowerShell in Active Directory. Daniel Petri recently had a good article on his site describing the steps for renaming a Windows Server 2008 domain controller. Here I’m going to describe a related but different task, renaming the actual domain. Renaming a domain is something you don’t want to find yourself having to do very often, or ever, in a production environment. However I have found the need to do it several times in a test setup; the process is similar to renaming a Server 2003 domain and isn’t as difficult as one might think. Enterprise Administrator credentials are required. The domain should be well formed and healthy. The forest functional level must be Windows Server 2003 or 2008, and all DC’s running at least Server 2003. A DNS zone for the new domain must be in place. The Rendom and Gpfixup tools must be copied to a domain member workstation to perform the rename operations. The operations should not be initiated from a domain controller. See the TechNet link below for details on requirements if you’re using DFS redirection, roaming profiles, running a CA, or Exchange Server. The domain rename is performed using the Rendom tool, which is installed with Active Directory when running dcpromo. Once this process is started, you must ensure that no changes are made to the forest configuration until complete. The steps are as follows. 1. Run “rendom /list” to generate a state file named Domainlist.xml. This file contains the current forest configuration. 2. Edit the state file, changing the <DNSname> and <NetBiosName> fields to the desired values for the new domain name. 3. Run “rendom /showforest” to show the potential changes; this step does not actually make any changes. 4. Run “rendom /upload” to upload the rename instructions to the configuration directory partition on the domain controller holding the domain naming operations master role. The instructions are then replicated to all other DC’s in the forest. Once replicated to all DC’s, the rename instructions are ready to be carried out. You can force replication by running the “repadmin /syncall” command. 5. Run “rendom /prepare” to verify the readiness of each domain controller in the forest to carry out the rename instructions. This should contact all DC’s successfully and return no errors before proceeding. 6. Run “rendom /execute”, this verifies readiness of all DC’s, then preforms the rename action on each one. There will be a service interruption during this period. Upon completion domain controllers will be rebooted. If an error occurs on a DC during this phase, the entire transaction is rolled back. Any DC’s that don’t complete successfully after this phase must be demoted and removed from service. 7. Run “gpfixup” to refresh all intradomain references and links to group policy objects. 8. Reboot client computers and member servers twice to obtain new domain name. Because the GUID’s of the domain remain the same during the rename process, domain membership is not affected. The DNS suffix of the client machines will also be updated assuming the default option of “Change primary DNS suffix when domain membership changes” is enabled. 9. Run “rendom /clean” to remove references of the old domain name from Active Directory. 10. Run “rendom /end” to unfreeze the forest configuration and allow further changes. This was frozen during the rendom /upload step. Should you have any problems with clients recognizing the new domain name, you can remove them by running “netdom remove <machine-name> /Domain:<old-domain> /Force”, rebooting, then rejoining the new domain. Once the rename is complete, there is one final change required on domain controllers. The DNS suffix of a DC is not changed as part of this process. This must be changed manually or the DC’s will have a DNS suffix that differs from the AD domain name.